Who Is the Hawaiian Airlines World Elite MasterCard Good For? If you want to go to Hawaii with miles, signing up for the Hawaiian Airlines World MasterCard is a good way to get yourself and a companion there quickly. The card not only automatically gives you enough miles for a round-trip flight, but it also includes a certificate and an automatic discount on Hawaiian Airlines award flights. HawaiianMiles and its credit card are good for much more than just getting you to Hawaii, thanks to the airlines partnership with eight partner airlines, including Virgin Airlines and partners on the mainland and in Asia. In fact, using HawaiianMiles is actually one of the cheapest and best ways to fly Virgin America. The Hawaiian Airlines World Elite MasterCard was long issued by Bank of America, but is currently transitioning to Barclays in much the same form. If you have the Bank of America version of the card, you will automatically receive a new Barclays card, though not the sign-up bonus, which is reserved for new cardholders. A 35,000 mile bonus after a $1,000 spend in the first 90 days the account is open is the current offer for the new Barclays version of this card. With the discount on award flights for account holders, this is enough for one round-trip economy seat between Hawaii and the rest of the U.S. In the past, a 25,000 mile sign-up bonus was standard. New cardholders also receive a one-time 50 percent discount on a round-trip companion ticket valid 13 months from when the account is opened. What Do Your HawaiianMiles Get You? 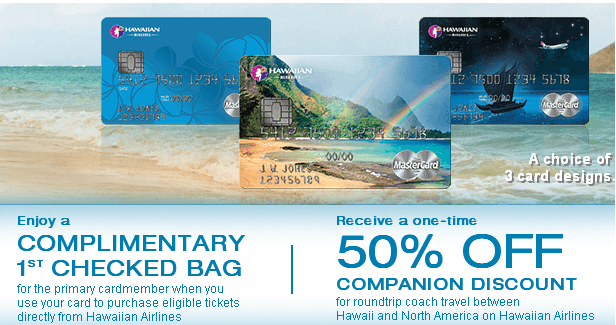 Redemptions using HawaiianMiles on Hawaiian Airlines-operated flights are very straightforward, though they can be costly if you don’t snag the lowest redemption level called Coach SuperSaver. Hawaiian operates three levels of economy award pricing SuperSaver, Saver and Flex and just Saver and Flex options in first/business class. Saver awards cost a touch more than SuperSaver (usually between one-third and one-fourth more depending on the route), while Flex awards, which do not confer any additional benefits such as American Airlines AAnyTime awards, cost twice the SuperSaver redemption rate. Unfortunately, partner flights cannot be booked online, and each partner airline has its own award chart. Some charts are advantageous, and some aren’t. Its best not to use HawaiianMiles on ANA, American Airlines, Korean Air or JetBlue. How Far Do Your Points Dollars Go? On Hawaiian, if you use your miles to fly to a neighboring island, you’ll pay 7,500 HawaiianMiles each way for a Coach SuperSaver award. A flight like this in cash, say between Honolulu and Maui, typically costs around $85, so you’re getting around a 1.1-cent value for your HawaiianMiles. Its not great, but its a savings on what you’d pay for that route with other types of miles. When you use your HawaiianMiles for a long-distance U.S.-to-Hawaii flight, between Washington, D.C. and Honolulu for instance, you get a much better rate for your miles. In low season, this flight costs $850, giving you a 2.4-cent value for your miles, while in high season, when flights are regularly $1,500 per person round-trip, you can get more than a 4-cents-per-mile value.